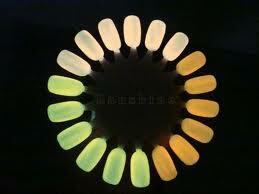 Here’s a cool way to get some glow in the dark nails. If you have some glow sticks around from an old party or whatever event it was you can turn it into something cool. Follow the following steps and you will have yourselves some new glow in the dark polish. Crack the glow stick in every place possible to help loosen the mixture inside of it. Cut the top and bottom of the glow stick with a pair of scissors maybe about a centimeter in length. Take a bottle of clear nail polish and empty the contents into that bottle, use an wood nail stick to help or a pen. That’s it, enjoy your new polish!